The worst part about Triptych is falling in love with Kalp, just as the humans, Gwen and Basil do, all the while knowing that he dies. No, that’s not a spoiler. His murder occurs right in the first few pages of the book and I was impressed by the way Frey’s clipped and intense descriptions conveyed Gwen and Basil’s emotional turmoil. Unfortunately, the next chapter was a bit problematic with Basil seeming to suddenly develop a British accent and affectations, too much focus on the inside jokes that result when people from the future visit the past, and far too much time spent with the use of parentheses mid-sentence to redundantly point out the actual (obvious) intent and emotion of a particular character’s thoughts. Fortunately, while annoying, I could get used to Basil’s poor British representation as time passed, and the parenthesized thoughts were confined to that one section. The next section introduces Kalp and is the highlight of the book. The few remaining aliens of Kalp’s world who escaped its destruction have arrived on earth, welcomed by the Institute (formed by the UN or such) with integration as the goal. Kalp is teamed with Gwen and the brilliant science-type, Basil. I enjoyed reading about Kalp’s awkwardness and seeing humans and humanity through his eyes. Frey did an excellent job with this and with the creation of this alien race and their physiology and customs. This part of the book clearly defines it as a bittersweet love story. 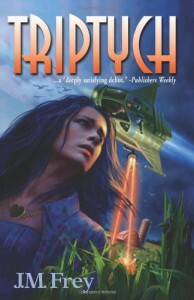 There is some tension created in the knowledge that triptych is fated to fall apart and the knowledge that perhaps it could be saved with some convenient time travelling, but I felt the conclusion of the book fell a bit flat. As expected with alien encounter stories, fear and prejudice is a prominent theme, but I did not enjoy the dastardly plan revealed at the end in a rather clumsy series of “action” sequences and a villain who was rather two dimensional. Overall, not a bad book and certainly very impressive for a first novel.